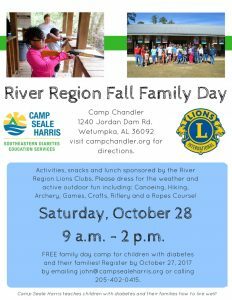 Join Camp Seale Harris for a FREE family day camp for children with diabetes and their families on Saturday, October 28 from 9 a.m. – 2 p.m. Register by October 27 by emailing John Latimer or calling (205) 402-0415. Activities, snacks and lunch provided by the River Region Lions Clubs. Please dress for the weather and active outdoor fun including: canoeing, hiking, archery, games, crafts, riflery & a ropes course!